For awhile now, the talk of the town has been “4K”. We hear a lot about it, and you can even buy a 4K television. On the other hand, 4K content hasn’t really hit the mainstream yet. In fact, it hardly exists at all. We do have plenty of new TVs and Blu-ray players that have “4K” printed on them, though. So what is this magical new format? What is 4K? What is UHD? More importantly, should you care? 4K, generally known as 4K UHD or 4K Ultra High Definition, is simply a screen resolution. That’s the short version. The maximum screen resolution for a DVD is 720 x 480 pixels. The maximum resolution for a FullHD Blu-ray movie is 1920 x 1080 pixels. 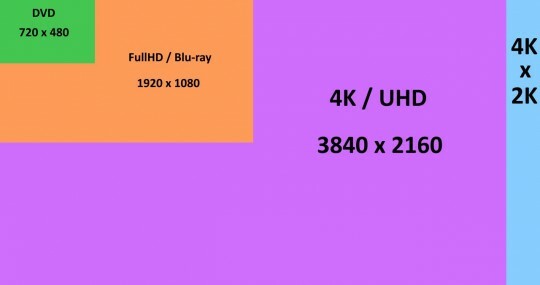 The new 4K standard is twice the width and height of a Blu-ray movie, or 3840 x 2160 pixels. There is also the mysterious 4K x 2K, indicated in blue in the above image. 4K x 2K is a professional camera/movie projector standard. It seems it was introduced with the movie Avatar in theaters. For our practical purposes, you don’t have to worry about 4K x 2K… If you buy a 4K TV, it will be 4K UHD (purply box in the above image). Finally, note that FullHD (Blu-ray resolution) is the same as a FullHD computer screen. It’s very likely that if you have a relatively recent LCD screen for your puter, it’s 1920 x 1080 pixels. You can’t really – not yet! You can buy a 4K television. They’ve been available for several years in most countries. There are very few 4K content sources available yet, even through online services. Also, Panasonic just released the first Ultra HD Blu-ray (4K) player a few months ago. It appears that 2016 will finally see the widespread introduction of Ultra HD Blu-ray players. And that means we should start seeing more movies starting to appear for sale in Ultra HD Blu-ray format. This new Ultra HD Blu-ray disc standard was only recently finalized, which is why we haven’t seen players widely available yet. What about my current Blu-ray player that says “4K” on it? More likely than not, that means your player has what is called “4K upscaling”. In short, you play a normal FullHD Blu-ray disc, and the player will quadruple the number of pixels. Of course, this isn’t true 4K, because the player is just creating 3 new pixels for each existing FullHD pixel, and then probably stuffing the “quasi-4K” image through some nice image processing to make the picture look nice. 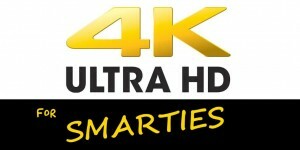 But, current “4K” Blu-ray players that are widely available are NOT capable of playing the new format officially known as Ultra HD Blu-ray. You will need to buy a new player that supports the new 4K disc standard if you want true 4K on your fancy 4K TV. Also, note that even if you do not have a “4K upscaling” Blu-ray player, your 4K TV will upscale the picture for you, anyway! So, you don’t really need a 4K upscaling Blu-ray player. It’s mostly a marketing gimmick. Existing Blu-ray players cannot be upgraded to Ultra HD Blu-ray. Wait for a real Ultra HD Blu-ray player! Will I need anything else other than a 4K TV and Ultra HD Blu-ray player? Not really. If your TV supports the 4K standard, and you get a new Ultra HD Blu-ray (4K) player, you should be all set. 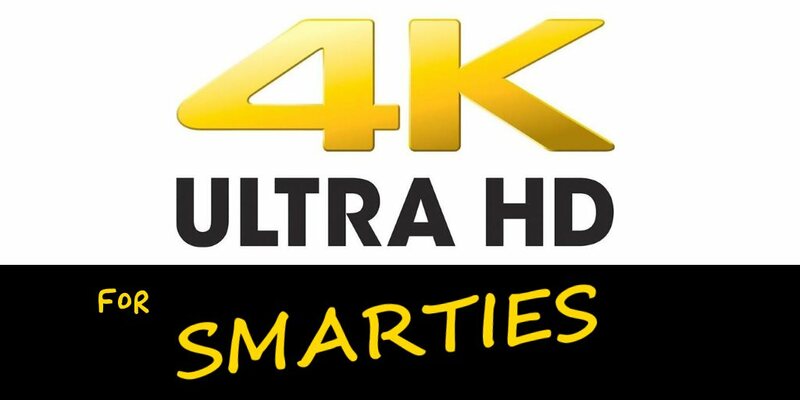 There is one little catch… There is a “flavor” of 4K that is generally just known as 4K @ 60Hz. 60Hz refers to the refresh rate. Current HDMI 1.4 cables will support 4K resolution just fine, but at 24Hz. That means your future Blu-ray 4K player will send a 3840 x 2160 pixel image to your 4K TV 24 times every second. If your TV supports 4K @ 60Hz, you will need to also buy an HDMI 2.0 cable. As far as I can tell, no one is selling HDMI 2.0 cables yet. That standard was also finalized relatively recently. I suspect that once Ultra HD Blu-ray players are widely available, HDMI 2.0 cables will be offered for sale along with them. There are also new new audio formats, DTS:X and Dolby Atmos, and of course new compression algorithms in Ultra HD Blu-ray. If you’re really big on surround sound, you may want to upgrade your home theater receiver, but that won’t be required – you’ll still get surround sound! But seriously, do I really need 4K? No. But if you’re in the market for a new TV, you might as well go 4K. The prices have come down dramatically in the past few years. And as with Blu-ray vs. DVD, Ultra HD Blu-ray will quickly become the new standard. All Ultra HD Blu-ray players should also play standard Blu-ray and DVD movies just fine. As for the improved resolution of 4K, I must say that to my eye, you can definitely tell a difference. It’s not the same huge increase that came with DVD over VHS, or with Blu-ray over DVD, but it looks sharper. And if you’re into huge TVs (like 50″ or larger), the extra pixel density of 4K will be most welcome. There is also the fact that Ultra HD Blu-ray also comes with some new color enhancement tricks. When paired with a modern 4K TV, you will probably notice richer colors, deeper blacks, and so on. Again, it’s not anything Earth-shattering, but it’s noticeable IMO. Of course! But, as it turns out, most indications are that 4K resolution is already approaching the limits of your average human eyeball. That won’t stop companies from selling something bigger and better, because of course they like to make money. So, there you have it. 4K / UHD / Ultra HD is just 4 times the number of pixels as a FullHD Blu-ray movie. Add in some faster screen refresh rates, a few color tricks here and there, some new compression and audio formats, and you have a new standard. You’ll need a new Ultra HD Blu-ray player, and preferably an HDMI 2.0 cable – when both are finally available for sale, which should happen this year. And of course, you’ll need a 4K / UHD-capable television! Hi. I recently purchased a LG 55EF9500 3D 4K tv. I was curious to know if it is worth it to pair it with a 4k upscaling blu ray player or if my tv would do the upscaling better than the player. I currently have a Sony BDP-S5100 3D blu ray player and was just wondering if this device upgrade was unnecessary. Usually I would go with letting the TV do the upscaling. Once UltraHD Blu-ray players are available for less than $1 bajillion, then I’d upgrade the player to one of those.